So far we love it here, a lot of people speak English, we’ve been very welcomed, not only by the men who led us but by many locals we’ve seen. We’re going to go to a typical Asian market now and look around and observe some of the colour of this trading town. We’ve seen markets in other towns and we’ll now go back and pick at the Samarkand markets after our trek to the Fan Mountains. But for now, it’s nice to be, as our border guard welcomed us to a new country. The Fan mountains are some distance down the road, we’ve got several hours of driving left, the man who led us probably said, you know this country is 93 percent mountainous. Right now you wouldn’t know that, right now we’re in a hot, rather dusty market town, but I know the mountains lie ahead, we’ll load into our Tajikistan vehicle and head to the Fan Mountains, we’ll report to you day to day as our journey continues. I’m calling you from Artuch base at an elevation of 7,200 ft. ( 2,200 meters) in the Fan mountains. 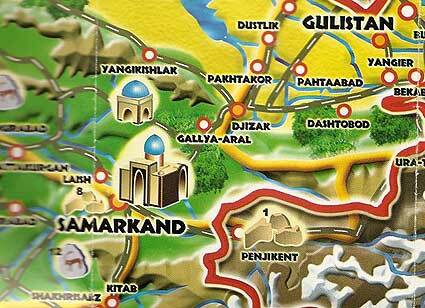 We’ve come a long ways today from Samarkand. This is a surprisingly nice facility, don’t worry, we’re going to be camping most of our nights as we trek through the Fan mountains. But for the beginning we have a beautiful lodge building with a nice dining room, little cabins that we’re sleeping in and reminiscent of the Elbrus region, the caretaker asked me just the question that I wanted to hear when we pulled up, he said “Should I get the sauna ready?” and I said, “Yes, get the sauna ready.” So, later this evening we’ll have a hot sauna to celebrate our arrival in the Fan Mountains. You know, yesterday in Samarkand, which seems very distant to the Fan Mountains, it was historical, cosmopolitan, and beautiful, but it was also 95 F (35 degrees celcius), and that wasn’t particularly hot according to the Atlanta members of this Berg Adventures expedition, especially since the heat was so dry in the desert, but you can imagine now, at a high elevation in the Fan Mountains how good the cool air feels to all of us. We see our first glaciers leaning above us and there’s steep rock mountain walls all around me now as the sun is starting to set. It’s a beautiful camp and we’ve glad to have left Uzbekistan crossed into Tajikistan and actually be at the beginning of our Fan Mountains trek.